As a SUP, or Stand Up Paddleboard instructor I was keen to find out more about SUP Yoga, especially as I have never had a go at Yoga! In countries like the USA it has really taken off, so why is it becoming so popular? I got together with local yoga instructor, now SUP yoga instructor, Rebecca Coales and put together our first SUP yoga lesson to find out! I sent out a general message about the session and filled it almost immediately. All had come through our SUP school on the 2 hour ready 2 ride course, so in complete control of a SUP. 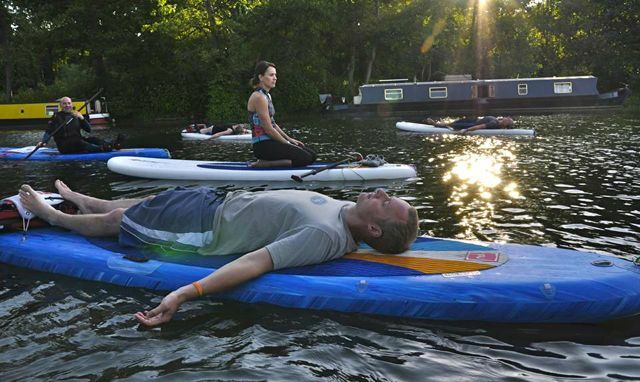 Before you can take part in a SUP Yoga class, you will need to have passed the basic course or lesson. We got onto the water and headed off to a spot that Rebecca had chosen prior to the lesson. A nice little spot out of the wind, tucked in nicely to the river bank and somewhere easy to anchor the boards. It was a little strange to hand over a lesson to another instructor, but also exciting with the prospect of chilling out for an hour! We went through a simple warm up and did a few stretches, ideal for getting your initial balance and readying your body. It was very relaxed and easy to follow, I felt myself getting right in to it. It did feel a little wobbly at first as we moved around the board, but after a while it leveled out and the yoga poses became easy to do and fun! The breathing exercises that you do along with the yoga poses really settle you into a nice relaxed state. I was feeling very chilled as we entered in to the last few poses, and when one of our group came unanchored and started to drift away, a gentle chuckle spread though the group before we went back in to chillax mode. The most relaxing time came near the end as we went in to the “corpe” pose. Hands gently resting on the surface of the water, trees swaying above head and a warm breeze rushing over your body. It was a lovely moment and and really did make me smile inside. This was my first Yoga experience, but it won’t be my last. After a busy day, its a great way to unwind your mind, and ease those tight muscles. I can really see the benefits for both body and mind for the future! Watch this space! 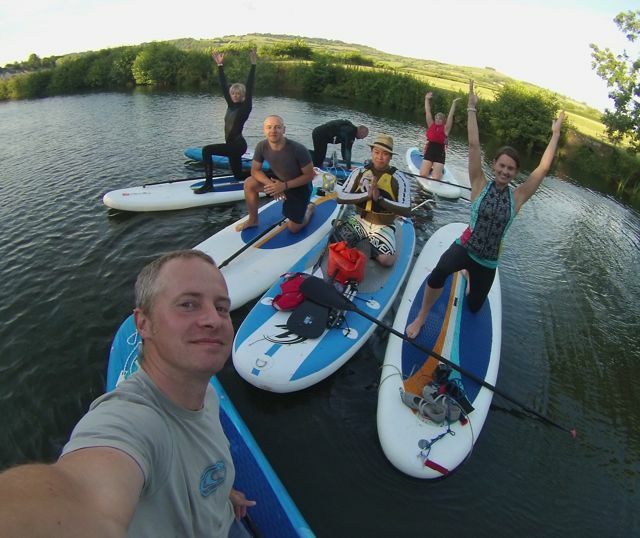 If you would like to find out more about the SUP Yoga lesson we were on that day, click on the following link and and come and join us.